Rumble seats for bicyclesâ€”a new version of the “bicycle built for two.” It is an Australian’s idea. 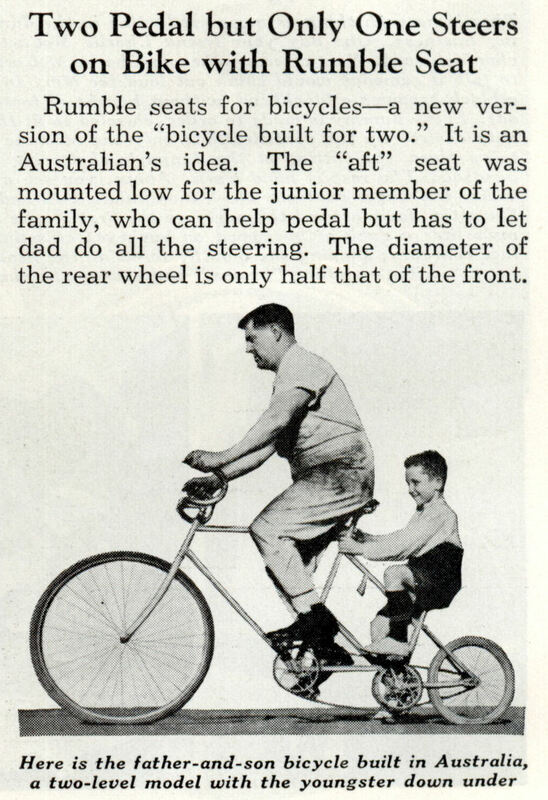 The “aft” seat was mounted low for the junior member of the family, who can help pedal but has to let dad do all the steering. The diameter of the rear wheel is only half that of the front. Don’t you just know that Junior loved going on long bicycle rides with nothing but Father’s rear to look at? You’d think Dad could wear clean trousers for the photo op. Hope dad has been laying off the chili and beer… maybe junior could get a windshield… so to speak?